Cool mechanical shark street mural in East Village! – Cool San Diego Sights! 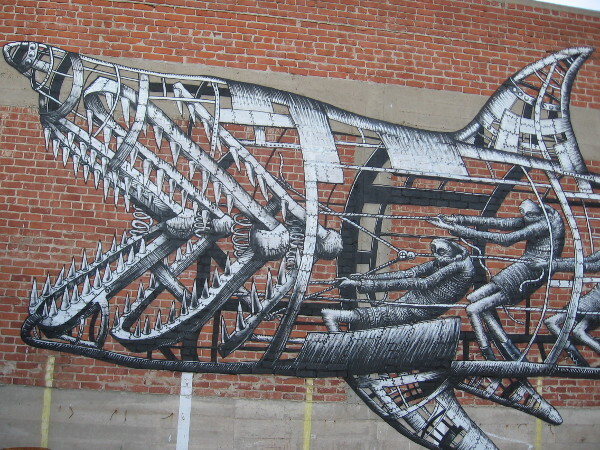 Cool mechanical shark street mural in East Village! Cool mechanical shark on parking lot wall behind Undisputed Fitness Center in East Village. A super cool street mural was recently painted in downtown San Diego’s East Village. I checked it out this morning! Located on a parking lot wall behind Undisputed Fitness, at the corner of 16th Street and L Street, this large work of art really catches your attention and draws you in for a closer examination! 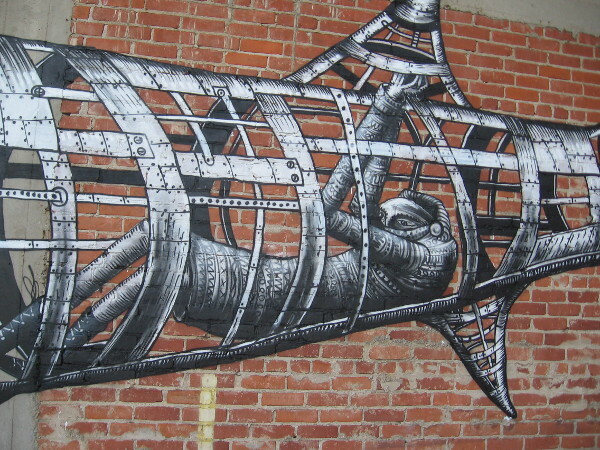 The image of a mechanical shark, operated from the inside by some sinister-looking people, was painted by Sheffield-based muralist Phlegm. I’ve never seen his work before, but apparently he often depicts similarly weird scenes, described as half-childlike, half-menacing. This particular mural was created as an act of “artivism” for PangeaSeed, an international environmental organization whose mission is to help preserve sharks and other marine species, through art and education. Sharks are being maimed and killed in large numbers for their fins, which are cut off the still-living animals and used to make shark fin soup and traditional medical cures in China. 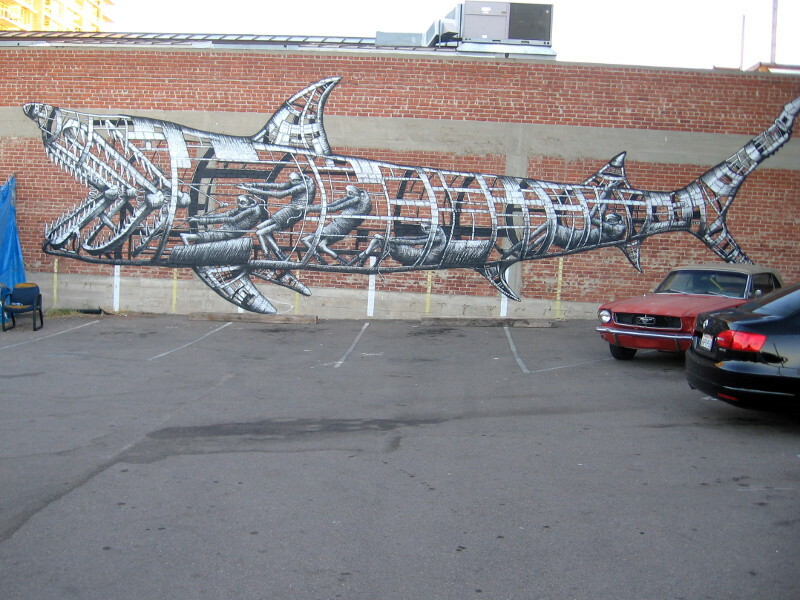 Street artist Phlegm painted this unusual shark for PangeaSeed’s Sea Walls: Murals for Oceans. Shadowy, mysterious people secretly operate the black and white mechanical shark. 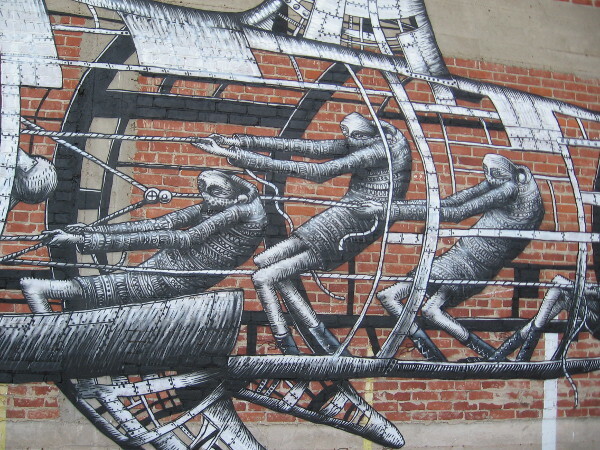 Phlegm often paints masked figures controlling odd contraptions in this illustrative style. Previous Previous post: Improvements on North Embarcadero celebrated! Next Next post: Awesome street art on a little old building.